Okay, I’ll admit it – I fell off the exercise wagon…again. Things got so hectic with the book deadline and two weeks of illness that I just couldn’t stay on track, but I’m determined to keep trying! 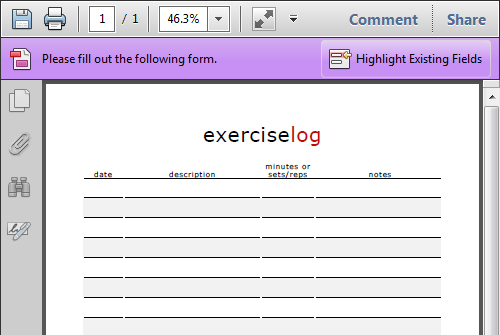 Jessica asked me to put together a printable exercise log, and I think it will help me to keep track of my workouts as well. If you’re doing aerobics or something similar, you can record one workout per line, or if you’re lifting weights or doing a variety of exercises, you can use several lines for the different parts of your workout. Click here download or print the free exercise log.